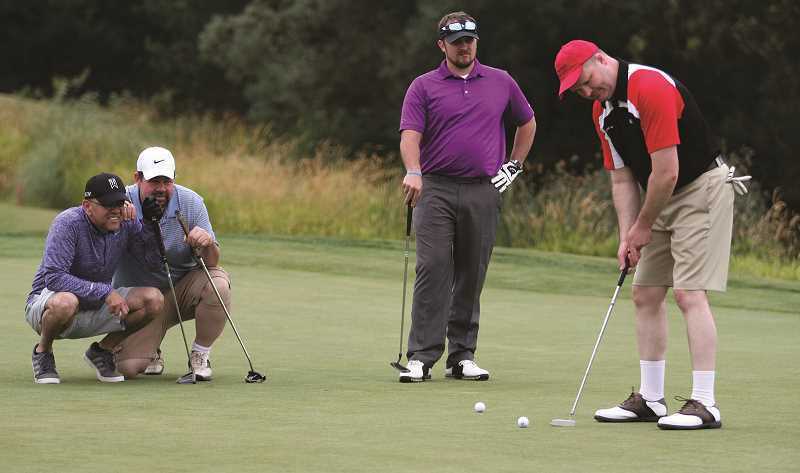 PHIL HAWKINS – Luis Molina and Brock Rempel huddle to the side, while Shawn Moyer-DeMarre stands to watch teammate Lucas Villa attempt a put on the ninth green at the OGA Golf Course in Woodburn on July 19. Volunteers at Love INC of northern Marion County are always looking for new ways to help within the community. The nationwide organization — which stands for Love In the Name of Christ — works in individual communities through a network of local churches, volunteers and organizers who seek to gather resources and distribute them to those in need.And there are always those in need, which is why volunteers at the northern Marion County branch are constantly seeking new ways to raise funds, such as last month’s golf tournament held at OGA Golf Course in Woodburn. The event is in its second year, and after raising more than $7,000 after operating expenses, volunteers were pleased with both the turnout and the amount of support they received for the fundraiser. After dipping their toes in the charity golf tournament circuit a year ago, organizers were excited to come back to OGA again, nearly doubling the field of players from the inaugural tournament from eight teams to 15, some of which made the trek from Beaverton and Portland to support the cause. “Everybody said they had a wonderful time, and several people said they were excited about the fact that we’ll be doing another one,” volunteer Rosetta Wangerin said. 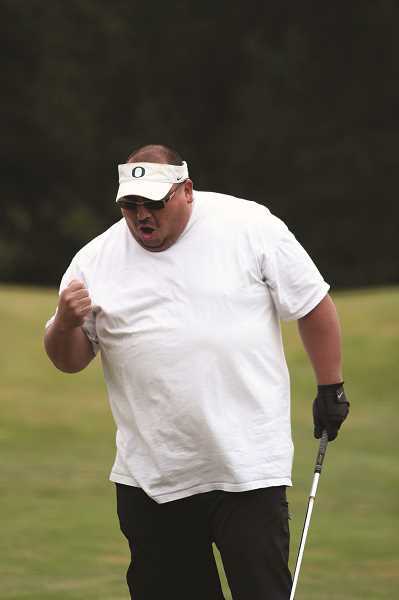 The fundraiser was held on July 19, hitting a sweet spot between Oregon heat waves that allowed for players to comfortably play the course without caking on layers of sunscreen and hiding out under trees for shade. The tournament acted as both a fun fundraiser and as a way to drum up recognition for the organization around the community. The event featured hole-in-one challenges on both the front nine and back nine where players attempted to win a new car from Hubbard Chevrolet or sink a shot to win $10,000 for themselves and for Love INC, courtesy of Dixon Golf. They were two of more than 52 sponsors that donated raffle prizes, sponsored holes, fielded teams for the tournament, or just gave cash donations to Love INC to support the program, which seeks to provide emergency assistance to those in need. That assistance can come in a variety of forms, from temporary help with bills, medical assistance, minor construction needs, hygiene products for the homeless and more. As Love INC’s influence continues to grow within its Woodburn office off of Hardcastle Avenue, more and more people are reaching out for assistance or to help volunteer. PHIL HAWKINS – Bubu Puente pumps his fist after a follow-up approach on the ninth that put his team on the green in birdie position. “We’re so busy down there anymore,” Talbot said. “It used to be that nobody even knew where we were, but you go in there now and it is hopping and full of people.”As Love INC attempts to meet the growing needs of those who request assistance, fundraising opportunities like the golf tournament have proved vital. The OGA tournament was one of many fundraisers the organization holds throughout the year. In June, volunteer Dorothy Monnier helped turn a golf tournament at the Woodburn Estates & Golf that coincided with the annual Rose Parade into a Love INC fundraiser, which netted the organization $800. And coming in October, organizers are getting ready to host their annual dinner auction — the Love INC Gala — which brings in upwards of $20,000. Every little bit helps, and volunteers are thankful for all the assistance they can get. “That’s the kind of thing that’s going to really make Love INC work, is that the community all helps,” Wangerin said. The goal of the organization is not simply to give away money to people, but to provide community members with a lifeline they can lean on in the event of unforeseen emergencies. “When we help people, we’re not going to give someone something if they’re not able to sustain it,” Talbot said. “You don’t want to pay somebody’s rent and then have them evicted two weeks later because they don’t have the means. They have to have a plan on how it’s not going to happen again. Wangerin recounted a time when a woman came in needing tires to help get her to her job, and Love INC coordinated with Les Schwab, which reduced the price of their tires that they then provided. In another event, one client was replacing a stove in her home, and when they pulled out the old stove, the floor had rotted away underneath it. She called Love INC, which helped coordinate someone to get new plywood and fix the hole. With the organization’s work in the community, it became a natural fit this year for Love INC to partner with the city of Woodburn to take on the city’s utility assistance program. Created in 2015 to provide help to people struggling to pay water and sewage utilities, the program receives $5,000 annually to provide customers with up to $150 a year to avoid having their service shut off. The program had disbursed just $1,675 through two non-profits since its inception three years ago. Since taking over the distribution of the money in May, Love INC has nearly gone through its initial $5,000 fund and is seeking additional money as it identifies more residents in need of assistance. “We have been very successful with that,” Wangerin said. As Love INC continues to grow and identify needs throughout the community, organizers will continue to expand its fundraising efforts throughout the year to meet those needs and are excited to see the amount of support they continue to see from individuals and businesses. Phil Hawkins can be reached at 503-765-1194 or phawkins@woodburnindependent.com. 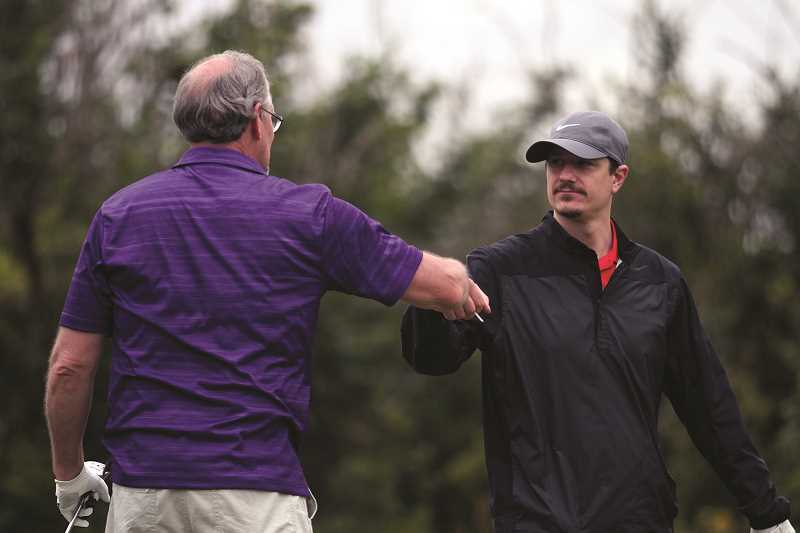 PHIL HAWKINS – Love INC Executive Co-Director Bill Park (left) celebrates with teammate Corey Knudson after a successful tee shot. Together with teammates Bubu Puente (above) and Charlie Hintz, the quartet was one of 15 teams to take part in Love INC’s second annual golf tournament fundraiser, doubling the field of last year’s inaugural event.